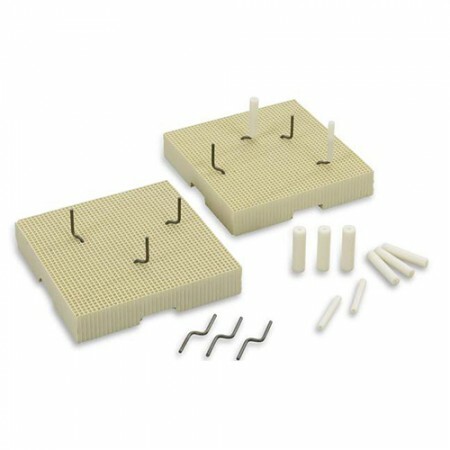 Honeycomb firing-tray set with adjustable metal retention pins, which are covered with ceramic sleeves. The ceramic sleeves are removable. Different pin diameters in combination with the close-meshed honeycomb structure of the firing tray enable easy positioning of the restoration as required. Constant firing temperature thanks to a low heat absorption. Can be used flexibly for all-ceramic and porcelain-fused-to-metal restorations. Durable insertion pins due to highly resistant metal retention pins. Very precise, customized positioning of the retention pins. Different pin diameters ensure optimum retention for molars and anterior teeth. Uniform degree of glaze due to close-meshed honeycomb structure. Copyright © 2019. Premiere Dental Sdn Bhd. All Rights Reserved.